A type of corn that is often considered to be a vegetable rather than a grain because it is most often eaten fresh like a vegetable. 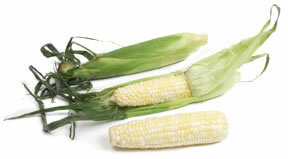 Sweet Corn is a good source of vitamin A, manganese, and potassium. Although there are many different Sweet Corn varieties, the yellow with yellow kernels and white containing all white kernels were the first to become favorites among consumers. During the late 1950's and into the 60's, agricultural research developed new varieties of Sweet Corn which contained higher levels of sucrose, referred to as "sugar enhanced" varieties. In addition, hybrid corn with multi-colored kernels were also produced from research to add to the sweeter flavored types available. 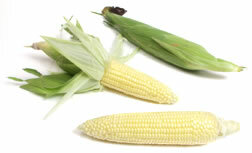 Several of the hybrid varieties include: white and yellow Sweet Corn that may be referred to as peaches and cream or butter and sugar corn and a red or scarlet colored Sweet Corn that develops its red color from the substance anthocyanin growing naturally in the corn as an antioxidant. Sweet Corn has a higher sugar content than other types of corn, but the sugar begins to convert to starch after it is harvested, so it can lose some flavor and sweetness after several days. Sweet Corn has the best flavor when it is eaten freshly picked, especially the sugar enhanced varieties that should be eaten or canned shortly after being harvested.